POPCORN! You didn’t think you could have this, did you? This is just cauliflower, but it looks like popcorn if you squint! Why? : Why not is the question! We thought it would be fun to make a low carb popcorn alternative. Especially for all you Netflix bingers out there! This is to have while sitting by the couch while watching your favorite show(s). Popcorn is the ultimate party snack accessory and unfortunately, real popcorn is NOT keto friendly. All of the recipes are Stupid Simple of course, but which one do we like better? Scroll to the bottom of this post to find out! We didn’t want to have any spoilers up here. The gouda cheese “popcorn” recipe is simple (you just slice the cheese into small squares) BUT you have to leave the cheese pieces out for 48 hours to air dry before you can bake them. Planning ahead is crucial for the gouda cheese option. The fried cauliflower “popcorn” option is our own spin on this keto friendly snack. We battered the florets in egg and dredged in almond flour and then fried to a crispy golden color. Step 1 - Cut the gouda and cut in to small pieces. We cut the pieces into approx 1/2” x 1/2” and about 1/4” in thickness. Step 2 - Place pieces on a piece of parchment paper lined baking sheet then cover with paper towel. Step 3 - Leave out on counter for at least 48 hrs to dry. Step 4 - After 48 hours, preheat oven to 400 degrees. Step 5 - Bake for approximately 3-5 mins. Step 6 - Let cool for a few minutes. Step 4 - Add about half of the florets to the egg mixture and make sure all florets are covered in mixture. With a fork, transfer the egg coated florets to the almond flour mixture and coat well with the flour. With a clean fork transfer the flour coated florets to a clean plate to rest. Repeat the same process for the remainder of the cauliflower florets. Once all florets are coated and the oil is has reached the temperature of medium high, its frying time! 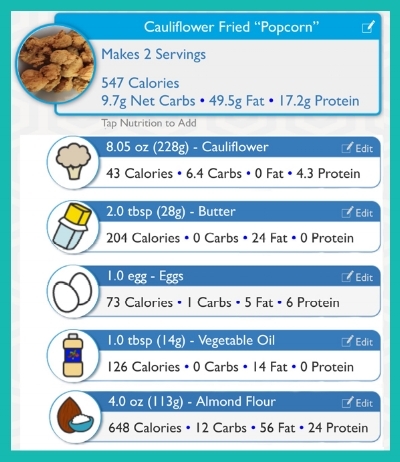 *Use MCT Oil, or peanut oil to be even more keto friendly! We really wanted to like the simple gouda cheese “popcorn” but it doesn’t look anything like popcorn, nor does it taste anything like it! It probably is the most tasty option, but we don’t think will be gobbling it up by the handful as it is a very rich flavor! 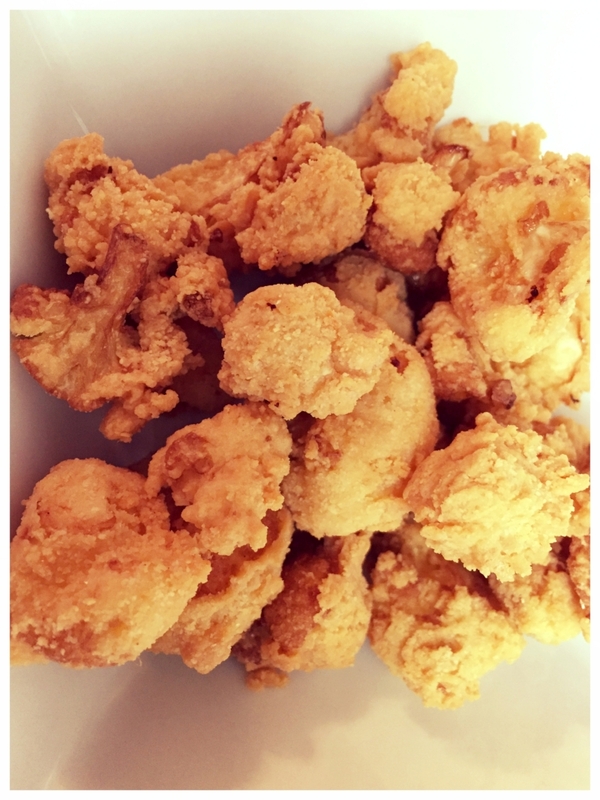 The fried cauliflower “popcorn” option satisfied our texture and taste buds and it can be seasoned any which you we like! Our own fried cauliflower “popcorn” version is the winner!